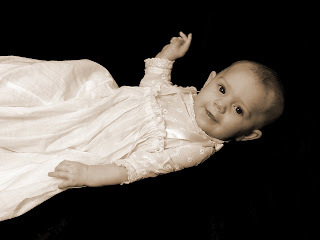 I can hardly believe it, Abby is 5 months old. Time goes by so quickly. She weighs 14lbs now and is really long. She changes everyday and is learning to make lots of noises and figuring out lots of things about this big world. At the park in her stroller. Look at those feet.. Her first time in the Jumperoo. She loves it. Standing on those feet is so much fun. I think that his is the sweetest picture. Just hanging out with Gramps. Chillin in her first time in the pool. She was in for over an hour and loved to splash. What a big girl. There are so many things out the window. Such a sweet girl. Always so content and flexible with everything. That is a great trait to have when mom and dad are both busy with work and there is a 3 1/2 year old brother around. Daddy just made her giggle real big. One of her new favorite things. Abby is wearing her great great grandmother's christening dress on my mom's side. It it beautiful and was so special for Abby to wear. Abby after being baptized was then given to a church elder. It was Tom Barnes a family friend. He assisted with Carter's baptism as well. After she was baptized our minister carried her around the church talking to her and the congregation. It was special. Our Family. Four Generations.. A family of generations. Patrick's parents, Nana and Gramps with Abby. My dad's cousin, Helen Katherine with Abby. After Abby's baptism we went back to our house for brunch. It was so much fun. This is Patrick's cousin, Mark's daughter Jessica, holding Abby. The girls at brunch just loved holding Abby. This is Neeley, her cousin. Neeley is 2 and she thinks that Abby is the best. So Cute. We were so lucky to have some of my family visit this past week, weekend and this week. I always love it when they visit and we had a great time. It is so neat to see them interact with my kids. The main reason to come was for Abby's baptism on Sunday, but we just spent precious time together that I will always cherish. Here are "alot" of pictures of their visit and many of Abby's firsts. I will post the baptism soon. This one was getting too long. My mom and sister arrived on Wednesday. These are just neat pictures of moments with Abby and her Grandma and Aunt Amy. Grandma flew in on Thursday. This was the first time that she got to meet her Great-Granddaughter. It was sweet. My Dad's cousin, Helen Katherine flew in from Ohio on Friday. This too was her first time to meet Abby. Friday was also my Mom's birthday, so we went out to eat and then came home for Birthday Cake. Carter thought this was so fun to spend this time with Grandma. My Grandma, played alot of games with Carter. It was so much fun to see them together. My mom reading with Abby. She really loved just sitting there and looking at the world. On Friday we also went outside and did water activities. My mom had brought this water firetruck for Carter, so we all changed into our bathing suits and headed outside for a little waterfun. Abby even joined in. Sorry, no adults pictures with water. Those images don't need to be published on the internet =). We had a great time. Abby had a few firsts during the family visit. Here she is for the first time in her exersaucer. She loved it and is growing so fast. Abby also had her first cereal too. This is a funny picture of her. She actually is doing pretty good with it. We laughed about it, but my Grandma could do this thing with her hand that Abby just loved. She calmed right down every time she did it. We just kept saying that Grandma is doing "karate". These are just a couple of my every changing and growing little girl. I will post soon about the baptism. It was wonderful. Thanks for looking at these special times with our family.